I visited the Canadian Museum for Human Rights in December. It is immediately the most outstanding tourist-focused building in Canada — and right now there’s nothing in it but construction material. When it is filled with innovative and interactive displays — many of which will showcase the evolution of humanity under the rule of law — the CMHR will herald a new era for a city overdue for a tourism reboot. Winnipeg’s reputation for too long has languished. Lambasted for its frigid temperatures in winter and buggy conditions in summer, the Manitoba capital has had much to overcome in perception. It has built momentum in recent years, thanks to an under-the-radar dining scene and the return of the city’s beloved NHL team, the Jets, who have stoked Winnipeg with more confidence and pride. Now, this. The CMHR. The name is boring, the building is astonishing. 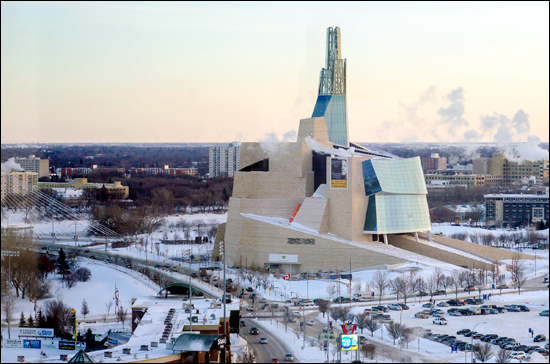 Designed by New Mexico-based Antoine Predock, the CMHR is 260,123 square feet of whoa. It explodes out of the landscape to grab your eye and break any prejudice you have held toward the city. What is a building like this doing in Winnipeg? That, I’m sure, will be a question many will ask. Once a visitor gains some knowledge about the $351-million facility’s home, the location will make sense. Truth is, Winnipeg has a history of grandeur that’s largely been forgotten outside of Manitoba. A century ago, it was home to 19 millionaires, more per capita than any other city in Canada, or even New York. Its Main Street is lined with former bank buildings constructed to be palaces of money. Twenty of them were positioned in a row like opulent dominoes. In their prime, they offered a spectacle of gild that would rival modern-day Bay Street in Toronto. Today, those buildings that remain have been converted into offices and restaurants. The city’s other architecture gem, however, is still serving its original purpose. The province’s capital building, the Manitoba Legislature, was constructed between 1913-20 and was the opus of Masonic devotee Frank Worthington Simon, educated in Paris and fanatical about creating a monument that adhered to the principles of an ancient temple. And no mere millennia-old place of worship either. Simon interjected his version of the Holy of the Holies — with a hidden Ark of the Covenant and all — in the design. The building is perfectly proportioned, the clues to its true purpose deciphered in the book The Hermetic Code by academic Frank Albo. It’s also a fun attraction. A feature in this homage to King Solomon’s Temple is called the “Pool of the Black Star” and it allows whoever stands on its tiles to throw his or her voice toward the heavens with a god-like burst. When I think back to my 2013 travels, one day will dominate my reminiscences — September 21. The last day of summer, the first full day of my return to British Columbia as a resident, and the single most stunning photographic experience of my life. I wasn’t alone in that assessment. 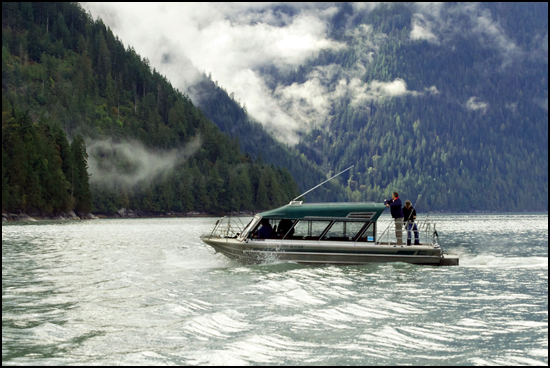 On a journey with a half-dozen well-travelled journalists and photographers, I witnessed grizzly bears snatching and chewing salmon within a few strides of where I stood, a school of 150 dolphins propelling through the north Pacific with a pair of full-span rainbows as a backdrop, and an inter-species dance between sea lions and some of those same dolphins in the gloaming of the night. This experience that was fit for a cinema took place in the Discovery Islands, a place all travellers should endeavour to find themselves one day. That morning and afternoon were captured in an article and photo slideshow published this fall. Except for a couple of sojourns to the Caribbean, I spent the entire year’s travels within Canada, exploring its abundance of wonders. Although my trip to Sonora Resort stands at the top, it was far from a singular highlight. Best dinner: I can never name just one, so here are three: Le Laurie Raphaël in Quebec City presented a happy mix of elegance, playfulness and culinary creativity; Araxi in Whistler showcased chef James Walt’s brilliance and passion for local food; at Sonora Resort, a Relais & Chateaux property, chef Terry Pichor treats diners to a course called “pre-dessert” — one reason why its tasting menu is a must for culinary travellers. Best dinner enjoyed at a bar: I pulled up a stool at Bar Isabel in Toronto and was wowed by a handful of zesty Spanish dishes that would fit suitably in Iberia. Oh, and the drinks are great, too. Best dinner enjoyed with a sabre: At Bearfoot Bistro in Whistler, the Champagne sabering ritual is something you have to do — read why. Best liquid lunch: I had a few of those at Chase, which has one of the premier patios in Toronto and a terrific rum selection.